For the Etsians...New listings Galore. The big thing I have been doing in the mornings as the holidays draw near is filling up my Etsy shop. Sometimes I forget it's there, because when someone wants to buy a piece they usually just call or email me if they are local, but I am trying to get most of my easy-to-ship pieces there so everyone can see them to purchase them (if you don't use paypal I do take money orders on my etsy as well). 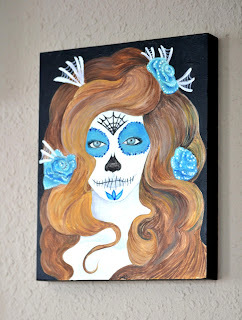 For fall I have listed one of my Muerta pieces, "Muerta no 8" and also some pieces from my last circus themed exhibition. "The Littlest Comedian" - Get him Here. 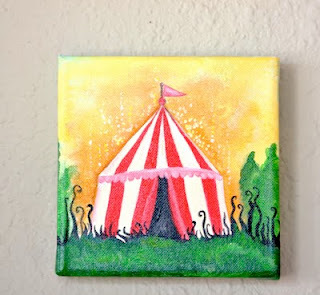 "Little Top" Mini Circus Tent painting- Get it Here. Muerta no 8 - 8x10 on wood- Get her Here. And florals for everyday collections and decor :) I love orchids. 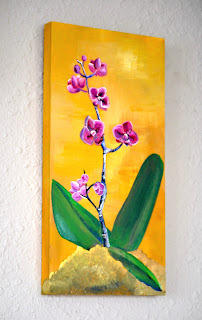 Moth Orchid - 6x12 on wood- Get it Here. Every piece in my Etsy shop is shipped with the same loving care as all the art I create. 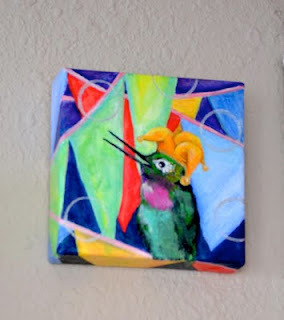 I hope you make a piece of my creativity part of your home soon... Next up will be more sketches, studies, and a special project I am working on for the Bella Foundation!